WASHINGTON (CNS) — The Sistine Chapel Choir came to Washington Sept. 20 on a rare U.S. visit. Its stops included Detroit and New York as well as The Catholic University of America, where it gave a concert and presented a workshop. The choir resembles the choir of the Early Renaissance period of 500 years ago in that it features all males, including about 30 boys, to sing the soprano and alto parts that were written with their vocal timbre in mind. Appointed in 2010 by Pope Benedict XVI, the priest’s commission was renewed in 2015 by Pope Francis. In a Sept. 20 interview with Catholic News Service, Msgr. Palombella, ordained in 1997, said that as the choir conductor, he gets to “dig roots” into the earliest years of the choir. Speaking in heavily accented English and having a reporter’s questions interpreted into Italian by the choir’s first-ever British member, Msgr. Palombella said the Vatican archives retain the music written all those years ago for the choir, with arrangements intended for the boys who populated the choir all those years ago. Back then, there were no liturgical roles for women; even the actors performing Shakespeare’s works at the Globe Theater in London were all men. Today’s members do not have the grinding schedule that the choir — organized in its current form in 1471 — once had. It used to sing virtually every Sunday. Although it rehearses for three hours a day, the choir sings at Christmas and Easter Masses at the Sistine Chapel and at about 20 other Masses and liturgical functions there, as well as concerts there and elsewhere, such as the September U.S. trip. The choir also makes recordings annually for the Deutsche Grammophon label and made its first-ever recording inside the Sistine Chapel. While the choir may be getting back to its roots, one obvious innovation has taken place. Instead of juggling sheaves of music and turning pages with one hand while trying to conduct with the other, Msgr. Palombella uses a tablet and does a simple swipe-left to change the page. Conducting the choir and selecting the repertoire is only half of Msgr. Palombella’s job. The other half is writing music. 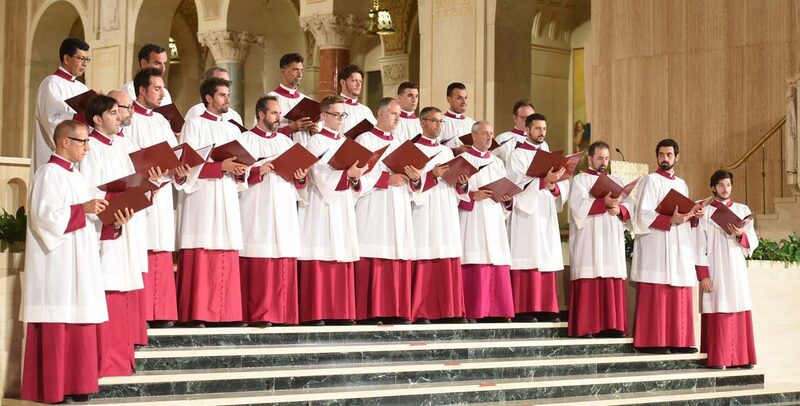 His charge, he said, is to combine both liturgical demands with the influences of contemporary composers to produce fresh material for the choir to complement its historic repertoire. A Catholic University spokesman said the Sistine choir had visited the school before, but it was at least 30 years ago. For the workshop, Catholic University music students were invited to attend, as were the music directors of nearby parishes, the spokesman said. Fourteen Sistine Chapel Choir members at the workshop demonstrated some of the group’s repertoire from composers such as Palestrina. All the choir members were adults; one was 22 years old, while others had more than 22 years of experience in the choir. Two introduced themselves as having served two stints in the choir, first as boys and now as adults. During the workshop, Msgr. Palombella said a direct line of continuity from the Early Renaissance to today cannot be drawn by the choir, even though it has been in existence for half a millennium, due to the use some centuries ago of “castrati” — boys who had their testicles removed before puberty so their singing voices would not slide into deeper ranges as they grew older. Introduced into the Sistine choir about 1620, the castrati had all but displaced boys by 1650 and remained in vogue for about two centuries, according to Msgr. Palombella, noting the last castrato performed at the Vatican in the early 20th century, after which time Pope Pius X forbade their use.